It treats beriberi, lockjaw, promotes blood circulation and reduces cholesterol. No it’s not a magic pill but the humble black soybean. I first tasted it in the form of bhatwani, a staple daal in Uttarakhand. It was a simple luncheon. Steamed rice served with bhatwani along with some fried red chillies. The meal tickled my palate and curiosity. A review of scientific literature, including The Journal of Nutrition and Nutrition Reviews, endorsed black soybean’s curative powers. These beans dominate kitchens in the Garhwal and Kumaon regions of the state. 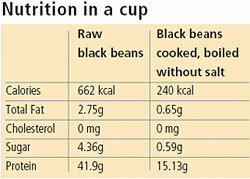 Kala bhat or black soybean belongs to the leguminosae family. Soybean (Glycine max) has seeds of many colours; the black one is rich in iron and protein. Grown extensively in Uttarakhand, black soybean is harvested in October and is available in markets at Rs 80 per kg by November-end. While bhatwani is Garhwal’s favourite, churkani is common in Kumaon. Use of rice or gram flour instead of rice starch used in bhatwani differentiates the two. 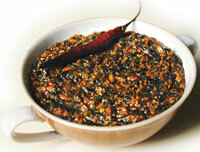 Another traditional preparation of black bean in the Kumaon belt is bhatiya. The dish is made by first soaking black soybean overnight and then grinding it to a paste. The paste is boiled in an iron utensil with broken rice and salt. It is given only to the daughters-inlaw due to gender bias. Giving “good food” to men is tradition and bhatiya is not considered good, said Chandra Malra who belongs to Kumaon and works as a supervisor in Mahila Sashaktikaran Vibhag, a department under the state’s ministry of woman and child development in Dehradun. Malra claims kala bhat can treat jaundice and cough. Method: Put one tablespoon of mustard oil in a pan and roast black soybean till it makes a popping sound. Crush the seeds while hot. Now add rice starch; quantity may vary according to the kind of consistency required. In a hot pan, add three-four tablespoons of mustard oil. When hot add finely chopped garlic. Now pour the mixture of rice starch and crushed black soybean in the pan. Add turmeric powder, garam masala and salt. Serve hot with rice and fried red chillies. Method: Put one tablespoon of mustard oil in a pan and roast black soybean till they make a popping sound. In another pan, put one tablespoon of mustard oil. When hot, add cumin seeds followed by chopped onion, garlic, coriander powder, red chilly powder, turmeric powder and salt to taste. Stir the ingredients on low flame. Now add the roasted soybean and water in the utensil. Cover the utensil with a lid. Allow it to cook till the black beans swell and become tender. Once cooked, make a loose paste of rice/gram flour with water and pour into the utensil. This gives consistency to the gravy. One can keep the gravy watery or thick, according to taste. Garnish the serving with freshly chopped coriander leaves. Serve with hot rice.